Achieving a modal shift to more active and sustainable travel modes in London is essential if it is going to become a healthier, cleaner and greener city to live and do business. Ensure that London’s councils have adequate funding and flexibility to make the necessary road and public realm improvements that will increase rates of cycling and walking. Our previous work in this area has included undertaking research on public attitudes to walking and cycling in London, giving evidence to consultation, and working with partners on a number of other issues, such as devloping positions on dockless bike sharing schemes, reducing congestion on London's roads, and increasing cycling infrastructure. The London Assembly's Transport Committee recently held an inquiry into London's cycling infrastructure. London Councils submitted a response following consultation with the boroughs and other key stakeholders. In the response we highlighted that there is a lack of information being shared on the development of a number of the cycle infrastructure schemes across London. 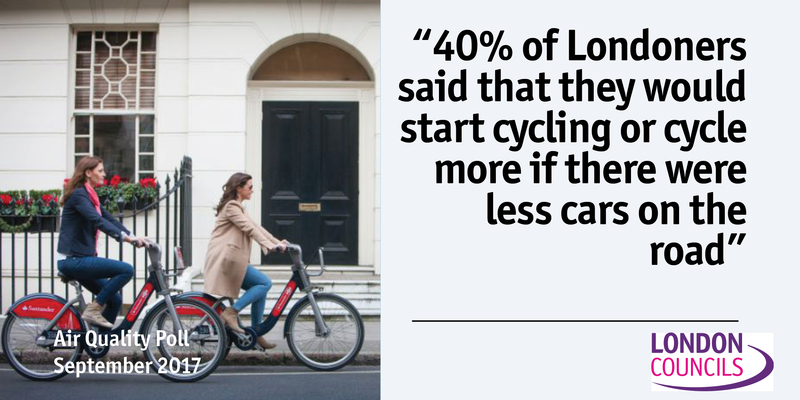 We also look to show that cycling infrastructure in London hasn't led to an increase in congestion and that when segregated cycle lanes are installed in London, the usership of this infrastructure increases as does user safety. You can read the full response here. In May 2016 we welcome the production of the government's Cycling and Walking Investment Strategy, though noted that London would receive little if any of the funding allocated by government as transport funding is devolved to the Mayor of London. We highlighted our concerns regarding the phasing out of TfL's revenue grant and the implications this will have for borough transport funding received from TfL. We asked governmen to look again at the classification of TfL grants as revenue rather than capital funding, and called on the government to set a more ambitious safety target. Our full reponse can be read here. Congestion on London's roads is a growing problem. Following a periood of stability, London's roads have been getting steadily busier and more congested for at least the last two years. Congestion can have negative effects on the economy, public health and the environment amonsgt others. London Councils submitted a response to the London Assembly Transport Committee's call for evidence into road traffic congestion in September 2016. You can read the full response here. In December 2016 London Councils also submitted evidence to the parliamentary Transport Select Committee's inquiry into Urban Congestion. The report analysed a number of traffic management measures and their benefits based on the experience of London. We also highlighted the role a number of different forms of transport could have in reducing congestion, and also highlighting the chaging make-up of the UK's roads and how local authorities will need to reflect this when tackling this issue. You can view the full submission here. The Safer Lorry Scheme has been developed in conjunction with TfL, The Mayor of London, Heathrow Airport and London Councils. The scheme is designed to ensure that all lorries on London roads are fitted with basic safety equipment. It will come into force from the 1 September 2015 and will operate across London 24 hours a day, 7 days a week. Learn more about the scheme and the requirements of the scheme. Support the increase of rapid EV chargers. Neighbourhoods of the Future (NoF) - local, innovative projects to prioritise and encourage the uptake of ULEVs. You can find out more about London Councils' work on the GULCS project here.